Muharram is the first month of the Islamic lunar month. Rabi’ al-Awwal is the third month. 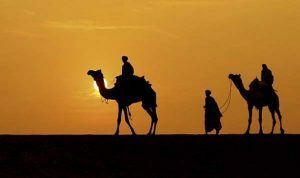 As recorded in Islamic history, the Prophet took the Hijrah (emigration from Makkah to Madinah) on the 1st day of Rabi’ al-Awwal. To claim that in his Hijrah the Prophet arrived on the day of ‘Ashura (10th of Muharram) in Madinah where he allegedly saw the city resident Jews celebrating the ‘Pesach’ (Festival of Passover, commemorating the deliverance of Israel from captivity in Egypt (1513 BCE) is like saying that he started his Hijrah on March 1, 2017 and he finished it on January 10, 2017.